It was autumn in the lush Minho region; an area of mist and granite of northern Portugal hard up against the border with Spain. 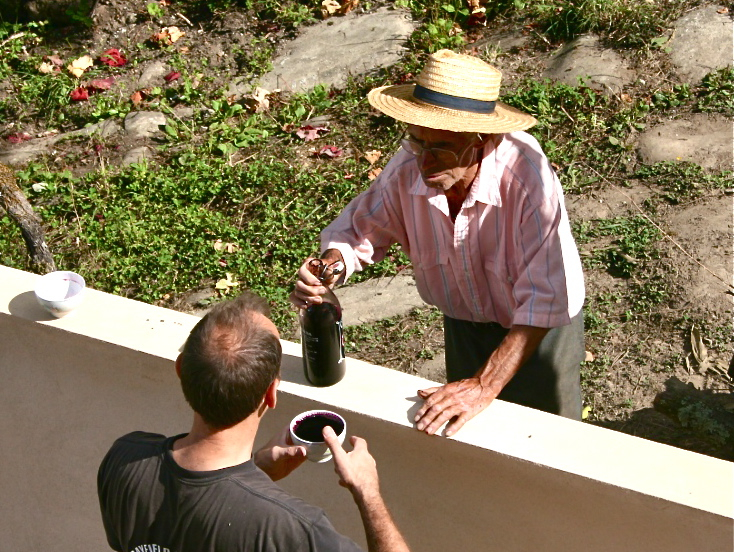 Our elderly neighbour Manuel was calling over to us. It was mid afternoon and time for a drink. He carefully poured the purple frothy liquid into white porcelain bowls and my husband Jon and I drank it down gratefully. His wife Carolina was busy cleaning out their adegga and giving last minute instructions to a steady stream of visitors, mainly relations and neighbours. The next day, 30 September, was to be the day of the vindima when they would finally pick their grapes. I had been wondering when they would finally get round to this. All the grapes on the terraces further down the valley had already been picked. Up to now the weather had been glorious but now the forecast was threatening. Minho region is in Vinho verde DOC (Denominaçao de Origem Controlada) with alvarinho grapes featuring in the Minho valley to the north and loureiro grapes favoured here in the Lima valley. 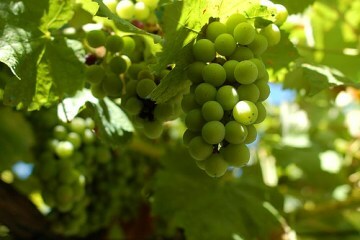 These grapes produce a light, crisp, slightly effervescent white wine that is drunk young (‘verde’). 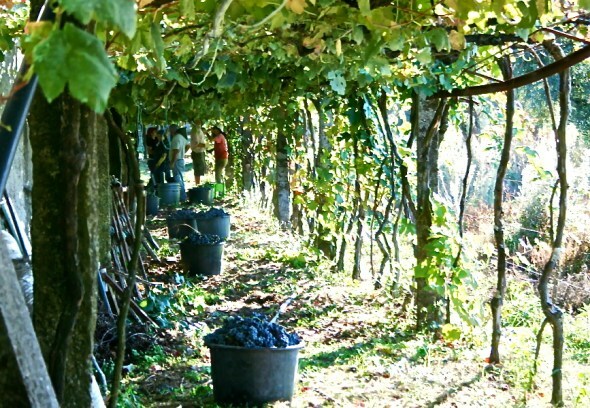 Red vinho verde is also popular and many of our neighbours produce this wine for their own consumption. The vindima is a community affair and as we were new to the area we had volunteered our labour as a way of getting to know our neighbours. ‘Falamos a manha – we’ll talk tomorrow’ Carolina shouted from her kitchen window when I asked her whether the weather could spoil the plans for the next day. As it was the weather held and all fifteen of us trooped down to the fields and hooked our buckets on the wires stretched between the overhead pergolas from which the vines hang. (I am told they are trained this way to keep the vines free from damp and frost and also to free up space beneath for other crops). We worked fast; threading our clippers in between the leafy vines to reach the large bunches of round purple grapes and then dropping them into our buckets. Every now and again the small buckets were emptied into larger buckets and once we reached the end of a row these large buckets were hoisted onto a trailer. The tiny tractor then toiled its way up the hill to the adegga while we tramped across the drying milho or cornfields to the next row of vines. Manuel and Carolina’s vines seemed to be scattered across the fields below their house but our fellow pickers seemed to know exactly which rows belonged to whom. Up at the adegga the vinhão grapes were tipped into a press and the corkscrew action propelled the dark red purple mass of juice, skins and stalks (bagaço) along a pipe into a large concrete tank in the corner of the cavernous adegga. There it bubbled ominously as the bagaço steadily rose to the surface. Lunch was a delight. All morning Carolina and her helpers were bustling around large black pots the size of cauldrons precariously positioned on grates under her huge chimneys. After vain attempts to scrub off the purple black stains from our skin we entered the low room and Carolina bade us be seated at the long trestle tables. The tables were decked out in her best table linen complete with bottles of thick green olive oil and jugs of last year’s wine. We were then served platters of bacalhau with steaming potatoes, chicken stew (made from two of her best birds) and rice cooked in gravy taken from the chicken stew. We cleaned our plates with chunks of broa or cornbread and drank wine from our bowls watching as our neighbours’ lips and teeth stained that purple colour so characteristic of vinho verde tinto. This was followed by a dessert called uvas papas which is made by gentling heating grape juice and stirring in corn meal. This is poured onto saucers and left to set to a jelly like consistency. This tasted better than it looked with the aromatic tartness of the grape juice cutting through the slightly stodgy consistency. Out came the coffee and bottles of the local firewater or aguadente. This particular version of aguadente is distilled from juice squeezed from the bagaço. I took a hesitant sip and felt it burn its way down my chest. Watching in amusement my fellow diners then poured theirs into their coffee and drank it down. It seems we were just in time. That weekend the heavens opened and one of the worst storms in many years battered the Lima valley. The summer’s forest fires had burned most of the vegetation on the hillsides and the resulting runoff cascaded down the slopes stripping the fertile soil and carving deep channels as it went. For several days after the vindima Manuel went down into the adegga and watched the bubbling mass in the concrete tank. Each day he offered us a sample and we reveled in the peppery berry fruit flavours. Judging the moment carefully he then siphoned off the liquid from the concrete tank into stainless steel barrels lined up along the old stone wall. This year’s vindima had yielded 3000 litres of wine. That should be enough to see them through to the next one. If you’re interested in joining Catavino on a stunning and highly customized tour of the Minho region, filled with regional Portuguese flavors and local wines, contact us today!